There are many models for building a fine team. 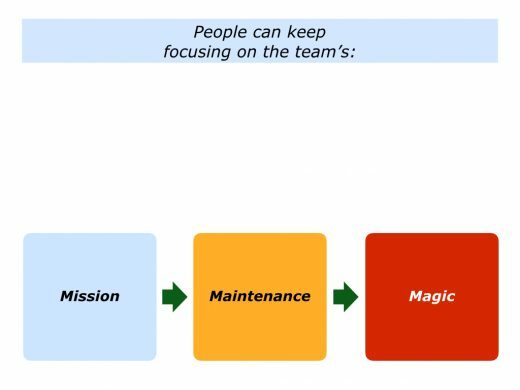 One approach is to ensure that people keep focusing on the team’s mission, maintenance and magic. Let’s explore each of these themes. People love to have a sense of mission. They love to feel they are contributing towards achieving something worthwhile. This can provide a sense of meaning to their lives and work. People want to feel proud of themselves, to achieve something, to leave a mark and a contribution, and they follow their plans for doing all that purposefully and tenaciously. The most powerful human motivator of all is the desire to be proud of ourselves in the pursuit of something we care about deeply. People also want to be treated like adults. This is particularly true of knowledge workers. They want to understand the context and see the big picture. They want to know the What, Why, How, Who and When. People are then more likely to commit themselves to achieve the goal. There are many views about the difference between a mission, purpose or vision. Some organisations try to list all three, but these can lead to confusion. People can spend hours arguing about the semantics of each view. Susan Ward produced an excellent definition regarding a mission statement which is reproduced below. You can discover more about her views, together with some examples of missions, via the following link. Many teams and organisations aim to create mission statements. Some work, but many fall short. An inspiring mission appeals to both the heart and the head. It can therefore be useful to focus on the following elements when clarifying a team’s mission. It should be one that recognises and builds on people’s strengths. It should be one that give people a chance to serve something greater than themselves and also be stimulating. It should be one that, providing they work hard, gives people the chance to achieve success. Different teams will have different missions. Some may focus on the team’s reason for being. Some may have a more specific mission – such as the being committed to achieving a certain goal. They may aim to find a cure for a disease or to solve a pressing social problem. They may aim to help people – such as students, customers or others – to achieve success. They may aim to build an innovative product or to deliver a worthwhile project. People must believe in the mission, however, because otherwise things fall apart. They must also believe that, providing they do their best, they have a reasonable chance of achieving success. The mission should also be crystal clear about the real results to achieve. Military personnel, for example, explain this on the following way. The result of toppling the tyrant, however, may simply unleash other forces in the region. We may then find ourselves bogged down for years. We need people to think things through. It vital to define the real results to achieve and then give us the resources to deliver the mission. Imagine that you lead a team. This may be a team you work in at the moment or one that you may work in sometime in the future. What do you believe is the team’s mission? What is its reason for being? What do people in the team really want to do? Try describing the team’s mission in one sentence. The sentence does not have to be perfect or cover every eventuality. But it is good if it describes the team’s direction. The mission should build on the team’s strengths and be stimulating. People should want to pursue it and feel they have a good chance of achieving success. Imagine that you have produced a provisional mission statement. 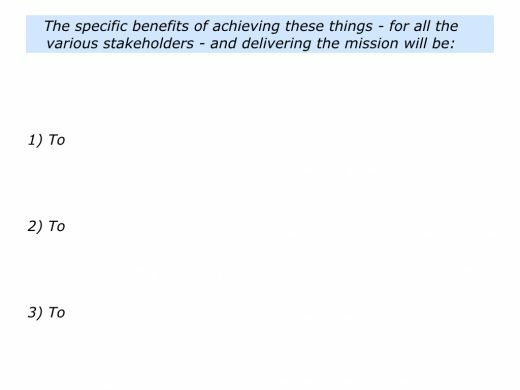 Looking ahead, what are the specific things the team can deliver that will be an expression of the mission? Pick a date in the future and describe the specific things you would like to the team to deliver by then. Be as specific as possible. But make sure that what the team delivers is an expression of its mission. Imagine that the team achieves these goals. What will be the benefits for the various stakeholders? These stakeholders may include the team’s employers, customers and team members. 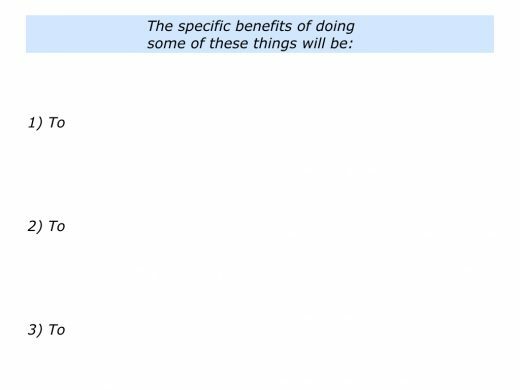 They may also include other people who will benefit. If you wish, try tackling the exercise on this theme. This invites you to focus on the team you work in at the present or one you may work in sometime in the future. It invites you to do the following things. 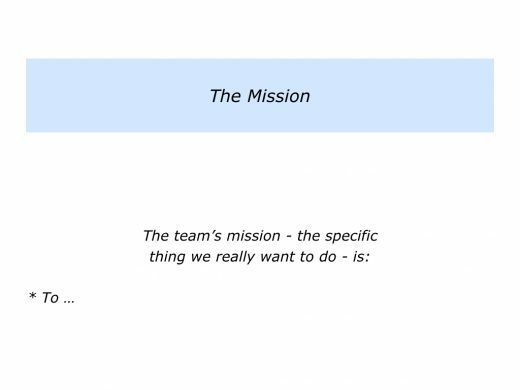 Describe the team’s mission – the specific thing the people in the team really want to do. Describe the specific things the people in the team want to deliver by a certain date that will be an expression of the team’s mission. Describe the specific benefits – to all the various stakeholders – of delivering these things. Imagine that your team has a clear mission. 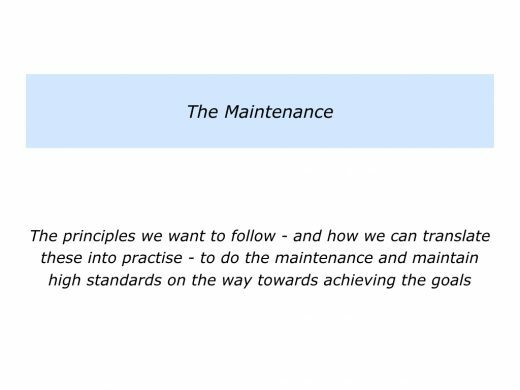 You can then encourage people to clarify how to do the necessary maintenance tasks on the way towards achieving the goals. How to make this happen? One approach is to encourage people to focus on the following things. The principles they can follow to achieve the goals. The practical tasks they must do to follow these principles and achieve the goals. The professional standards they must maintain when doing these tasks on the way towards achieving the goals. Different leaders take different approaches to encouraging people to take these steps. Some involve people in both clarifying the key principles to follow and then fleshing out the detail. Some outline the key principles and then involve them in clarifying how to translate these into action. 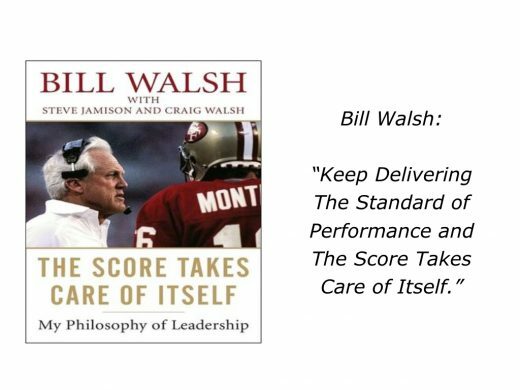 Bill Walsh, the American Football Coach, believed it was vital for everybody in an organisation to deliver certain standards of performance. He said that, providing they did this, then the score took care of itself. Bill believed that leaders must begin by developing the right strategy for delivering success. This included developing the right planning for tackling various scenarios. He explained this in the following way. You must envision the future deeply and in detail – creatively – so that the unforeseeable becomes foreseeable. Then you write the script for the foreseeable. Of course, there’s always something you can’t anticipate, but you strive to greatly reduce the number of those foreseeables. Bill followed the 80/20 rule. 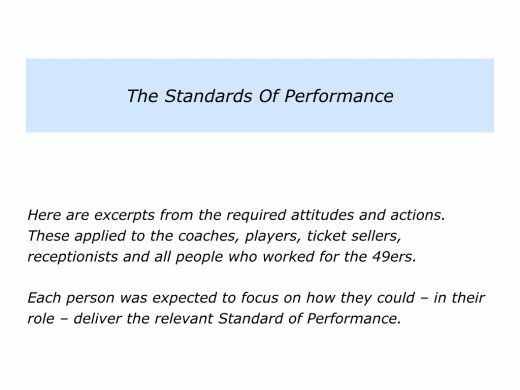 The 49ers focused on maximising the 80% they could control in a game. There may be 20% they couldn’t control, such as a referee’s call, a bad bounce or fortune. Maintenance workers, ticket takers, parking lot attendants, and anyone receiving a pay check with the emblem of the San Francisco 49ers on it were instructed as to the requirements of their own job’s Standard of Performance and expected to measure up. Some people chose to stay and deliver these standards. Some chose to move on. Here are some of the principles and practical steps Bill invited people to follow. Imagine that you want to take similar steps in your own way. Here is one approach. 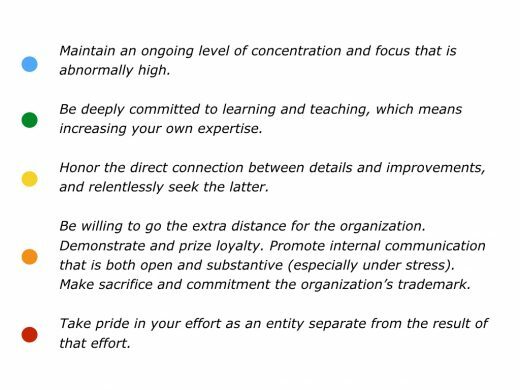 To explain the reasons why it is important to follow these principles to achieve the mission. To bring the principles to life by giving specific examples. To, if you wish, invite people to add any further principles that they believe it is important for the team to follow. Imagine that you have taken these steps. You can then invite people: a) To focus on each of the principles; b) To describe the specific things they can do to translate each of the principles into practise. One key point: It is important for people to focus on what they can do in their specific areas of work. It should not be an academic exercise. You can invite people to present their ideas. Keep going until all the principles are covered. 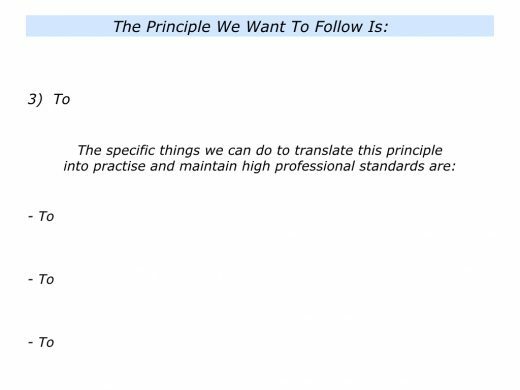 People can then be invited to commit themselves to following the principles and translating these into practise. They can then, at a later date, present their action plans. You can provide them with the support they may require to deliver the goods successfully. 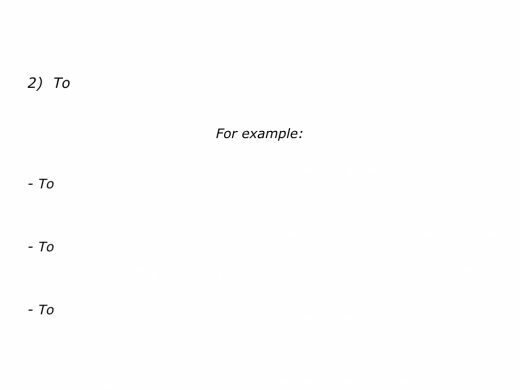 Here is the exercise that you may wish people to tackle to ensure the maintenance gets done. Great teams always do the maintenance. 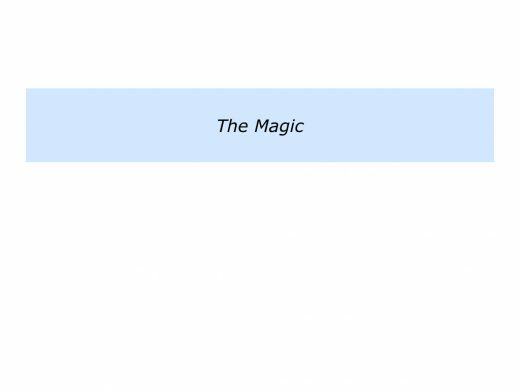 They also have people who can deliver the magic. Bill Walsh’s San Francisco 49ers, for example, had star players who demonstrated great skill when it mattered. I would like you to reflect and decide if you really want to follow the professional guidelines that we have as a team. If you want to join us, then the main messages we want to give you are these. We want you to build on your strengths, do what you do best and keep improving. We want you to be you, rather than somebody else. We also want you to encourage other people – such as your teammates, support staff and the fans. We want you to use your talents to help the whole team to succeed. How can you do this in your own way? Imagine that you lead a team. It can be useful to do the following things. You can explain the team’s mission and the principles people are expected to follow to achieve the mission. 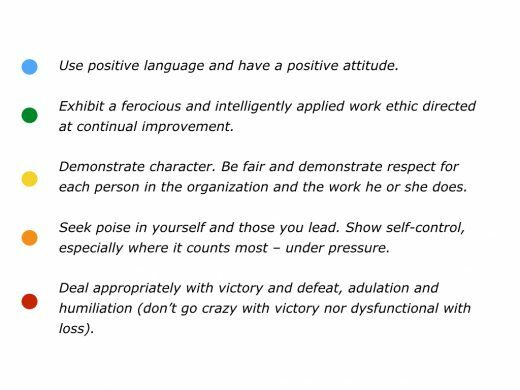 You can employ people who want to follow these principles and use their strengths to achieve the mission. You can build a strengths based team by putting the right people in the right places where they can make the best contributions towards achieving the mission. You can build on people’s strengths – the specific activities in which they deliver As rather than Bs or Cs – and make clear contracts about their best contributions towards achieving the mission. You can encourage people to use their strengths to keep doing the maintenance and, when appropriate, to add the magic required to achieve the mission. Imagine that you have taken these steps. You have also involved your people in clarifying what they must do to deliver the maintenance. If you wish, you can then involve them in the following exercise regarding how they can add something special. Here is a snapshot of some ideas that teams have produced when invited to do this exercise. To build on our strengths … To put the right people in the right places in the team … To get the casting right by putting the right people with the right customers … To encourage people to use their strengths to help our customers to succeed. To keep delivering the Scorecard – the mandatory things we must deliver to keep our bosses happy … To also do stimulating projects that benefit the organisation … To build successful prototypes and produce success stories. To create a stimulating office environment … To create a work place that works for introverts – who like quiet spaces – and extroverts … To involve everybody in our regular monthly updates about the progress we are making towards achieving the mission. To follow the motto that ‘the best way to learn is to teach’ … To ensure that people go to conferences, read books or visit great organisations … To organise sessions in which they teach us about what they have learned. To spend 50% of our time out with customers and become trusted advisors to them … To work with pacesetting customers – those who are tackling challenges that others will face in the future – and help them to find solutions to these challenges … To use this knowledge to produce our own future products and services. There are many models for building fine teams. One approach is to encourage your people to keep focusing on the mission, the maintenance and the magic. Here is the final exercise on this theme. 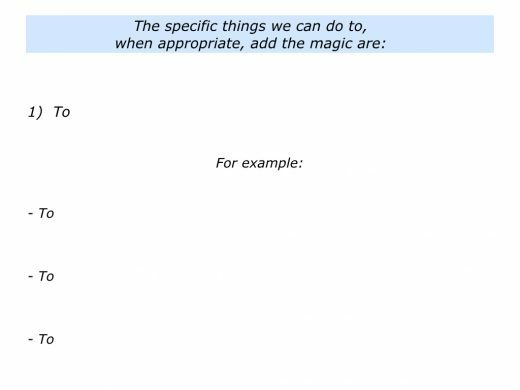 This invites people to describe the specific things they can do to add the magic and the benefits of taking these steps. You can then encourage people to do these things and keep building a great team.